The UberHIRE XL is a flexible service with which riders need only pay for the time and distance they have travelled. The service has a minimum fare which starts at Rs 359. 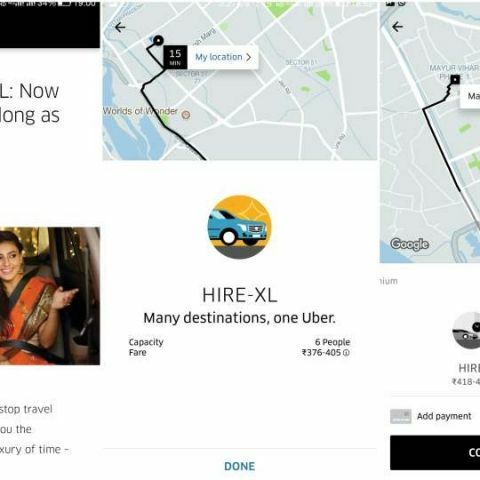 Uber has announced the launch of its UberHIRE XL service in Delhi. The ride-sharing service now allows up to 6 rides to travel together and offers multiple stops during trips. It is a time-based service and is available on-demand for users. The service starts at a minimum fare of Rs.359, which would cover a trip for 1 hour and up to 10 kms. Uber, the world’s largest on-demand ride-sharing company, today announced the launch of uberHIRE XL in Delhi. Aimed at enhancing mobility experience in the city, uberHIRE XL will enable upto 6 riders to travel together and book both day long trips as they go exploring the shopping districts and long distance journeys across NCR. Based on strong rider demand as well as deep understanding of the local economy needs, uberHIRE XL is a time-based service that will be available on-demand for riders, offering them with an economical, convenient and reliable travel option. With this service, riders can hire a 6 seater for all their travel needs be it day or night, whether it is to explore the city’s scenic beauty or for business travel and multiple meetings. UberHIRE XL makes for a great use-case for the wedding season too both in terms of shopping adventures across town as well as travelling back and forth from wedding venues as a family. The launch of UberHIRE XL in Delhi comes just in time for the festive and winter season. Riders can avail this service at a minimum fare of Rs.359 in cash that would cover the trip for 1 hour and up to 10 kms and comfortably travel with friends and family. Uber has always believed in the transformative potential of technology and strived to harness it to solve for some of the most complex problems and urban infrastructure challenges that cities face today. What makes UberHIRE XL unique is its ability to become a one-stop solution for both large groups of travellers wanting to ride together to fewer riders looking for extra space while taking day-long trips with multiple stops across town. The pricing is flexible unlike fixed packages and riders only pay for the exact time and distance that they will use UberHIRE XL for. At the end of your trip, your total fare is calculated based on the distance and duration of your trip. You can pay in cash and receive an e-receipt at the end of your trip.